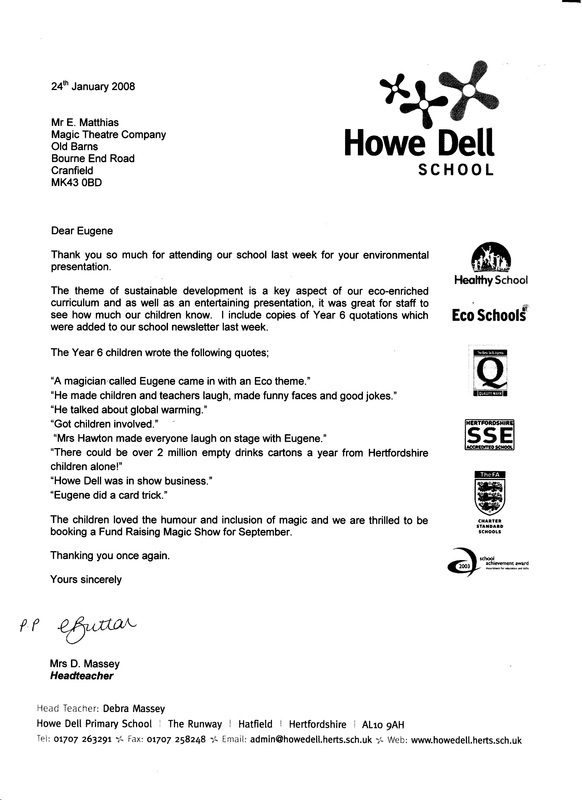 Recommendations from Government agencies and teachers on our educational magic shows. and workshops. It was very easy to organise with lots of communication and helpful advice from you, ie advising on show times and how to raise more money for our school by selling refreshments and holding a raffle. The actual shows themselves were absolutely amazing. Lots of audience participation which everyone enjoyed, plus a great escaping act by Rodan. Thank you again and we look forward to hopefully hosting more shows in the future. I just wanted to feedback how pleased I've been with magic club for my son Robert. Previously he's not been very confident or keen to participate in front of an audience, so it was really lovely to see him so eager to join in and show us everything he's learned in the end of term show. Thank you for the brilliant anti-bullying magic show. All our students and staff enjoyed it very much and it certainly conveyed a strong message which they all understood. Your tricks are great with some of the students still talking about them. Thank you so much for today, what a very positive start. Being a special needs school it is very difficult to engage pupils and keep concentration. ​The children concentrated so well that I now realised we can add fine motor control to our outcomes. Thank you for your entertaining anti-bullying show. The children and staff really enjoyed it! I have spoken to Michelle, who was the teacher involved and together we feel the children were fully engaged throughout the whole show and the importance of Maths messages were made very clear. Thank you for your wonderful performance combining the Anti-bullying message with magic so effectively in a fun and engaging assembly. The magic tricks drew the children in and entertained them, making them receptive to the more serious subject that was addressed in a way that all of our children could access. The children’s laughter and general buzz around the school was a clear indicator of the impact of the performance. Feedback from parents has been entirely positive, the children clearly went home to tell their families all about the experience and more importantly the message that you delivered. The children and staff really enjoyed the Anti-bullying Magic Show yesterday. The feed back was so positive that our headteacher has said we can book the E-Safety show for February. We wondered if you had a slot free for an afternoon performance the week beginning the 9th February 2015. Thank you for this afternoon, it was amazing, lots of smiling faces........a good sign! Would you happen to be free on Saturday 30th July, in the evening? ​I am organising a County Brownie Camp. Many thanks again for a fantastic anti-bullying show today. It was thoroughly enjoyed by everyone who saw it. The children were still buzzing later on as they were doing follow up activities! Many thanks for sharing your fantastic E-Safety Magic show. You had all the children engaged, whilst sharing very important information. Absolutely amazing and lots of fun. I have spoken with Tracy and she is happy for me to book both clubs again for the new year. I also wanted to let me you know that a parent called the office today to say how much her son had enjoyed Magic club and that he would definitely sign up again. With regard to Sheila’s craft club – We would like to say thank you for running such an enjoyable club. The children loved it and we would have no hesitation in rebooking. Having returned from holiday, I would like to thank you very much for the amazing show you put on for our evening. I have had so many excellent comments about how very funny you were and the magic of course was seamless. I'm sure you got a feel for that anyway by the amount of laughing from the audience. Personally, I still can't get the image of the folded banana out of my mind. Brilliant! I look forward to future opportunities of seeing you perform and in the meantime I hope your 'retirement business' continues to boom. Just wanted to say a BIG thank you for the show on Friday morning. The children, from Nursery to year 6, thoroughly enjoyed it and so did the staff. All staff, who watched it, said how brilliant and funny it was. 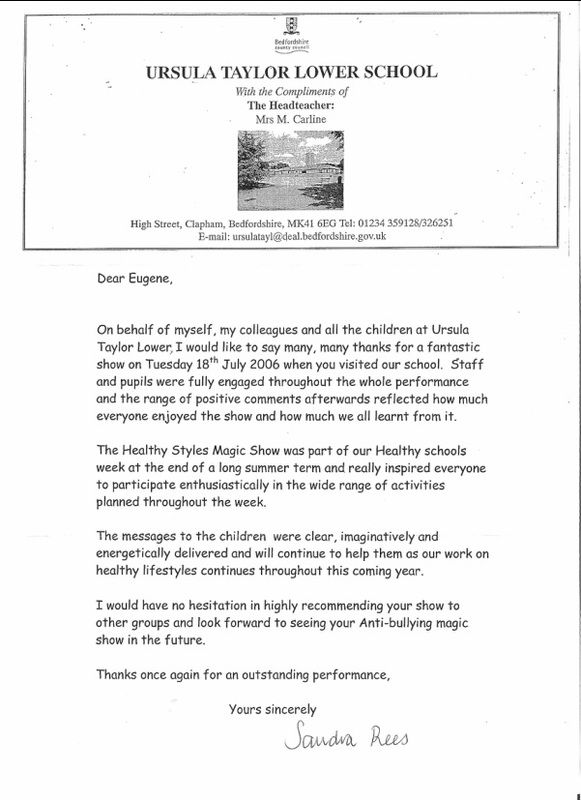 I mentioned the Anti Bullying show to the headteacher who was keen on booking it. Am I right in thinking Anti Bullying week this year is 18th-22nd Nov? What dates do you have available that week? Recommendations on our educational shows and workshops.